Mourinho Now Wants Omeruo to Train With the Main Squad. Chelsea Boss Jose Mourinho has reportedly ordered Nigerian defender Kenneth Omeruo to quit training with the club’s reserves and move up to the main squad as plans to loan him out in the January transfer window may well be on the card. The Super Eagles central defender’s adviser, Chika Akujobi, told MTNFootball.com the Portuguese boss has been pleased with Omeruo’s development since recovering from a shoulder operation. Chelsea are interested in getting the 20-year-old “regular playing time” and could be shipped off on-loan to a Championship side next month. Such move could likewise brighten the defenders’ chances ahead of Nigeria’s participation in the 2014 Fifa World Cup in Brazil. “Chelsea are studying various offers for Kenneth. They want him to enjoy regular playing time and so will work with a club who can guarantee this,” Akujobi disclosed to MTNFootball.com. 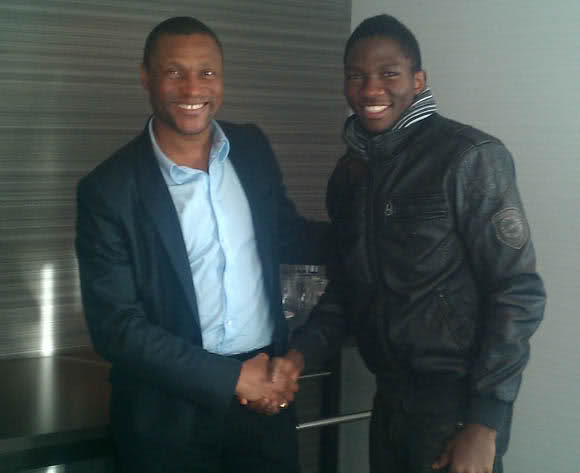 Omeruo and Chelsea Technical Director Mike Emenalo. Omeruo spent a season and a half on loan at Dutch side Ado Den Haag before getting his work permits to stay in England in August. Coaches Hail Boxing Federation Boss. UAE 2013: Nigeria’s Golden Eaglets Become the Most Successful Team at the U-17 Level. Swansea Considers Swooping for Albion Striker Odemwingie. Previous articleCanada 2014: Falconets Thrash Tunisia 4-0 to Reach Final Qualifying Round. Next articleCommonwealth Games: NOC Boss Prods Athletes to Get Ready for the Best in Glasgow.